This stretch and many others in New Jersey—the Lawrenceville/Princeton Route 1 strip and Route 10 in East Hanover come to mind—was once a motel-and-diner route that was bypassed but not killed by the Interstate. Some of the original build-out, both architecture and signage, still remains, albeit largely transformed and repurposed. As a child, a drive down Route 22 meant a family shopping trip. As recently as the early 2000s, it included such vanished outposts as Sports Authority, Sixth Avenue Electronics, The Wiz, and many others for which, in our dizzying economy, there’s little evidence left of their erstwhile existences. A peculiar building transformed and maintained through multiple business changes—kitschy, but good urbanism. A 1960s motel sign; building recently demolished. Probably among the first post-war structures built on Route 22. There are, of course, plenty of real towns behind and between the “retail corridors” of strip malls and chain restaurants. It is true that the coveted several miles of highway frontage that each distinct municipality on the route claims are a major source of revenue and jobs. Most articles about the economy of North Plainfield, for example, center around projects along the North Plainfield stretch of the Route 22 strip. Yet these strips display little of the character, human interest, and diversity that off-highway places do. For example, mostly absent on the strip are niche or ethnic businesses, which have more trouble affording the high rents. Within a couple of miles of Route 22 are a Polish deli with an excellent homemade $6 lunch special, a German grocery shop selling locally produced kielbasa and smoked meats, and a small butcher. Along the nearby highway itself are a stranded motel sign—the motel has been torn down—and large centers featuring Target, Walmart, and Best Buy. Driving these strips can feel uncannily like running somewhere in The Flintstones. Martinsville, NJ: a small Main Street-style commercial strip, center, entirely surrounded by cul-de-sac neighborhoods. Copyright Google Maps 2018. Another remnant of early post-war signage. There were originally five cans. Posted in Retail, Preservation, Suburbs. 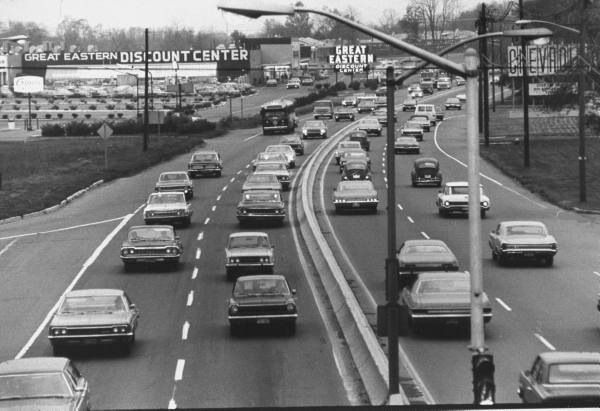 I worked at Great Eastern after school in 1966 while living in Bridgewater – 25 minutes along Rt. 22. When I go back so much has changed; but it is still Rt. 22; turning in on itself; maintaining its character. The author might Google Map Cedar Bluff, TN for a newer, more stark version of the story. The Kingston Pike (Rt. 11), to the west of Knoxville contains a compendium of every franchise known to America. But if you pan out there is a slim surround of cul-de-sac land then… right there… endless countryside. The pattern, I’m sure, is often repeated. However, though many places have the name, I think only Rt. 22 has (had?) 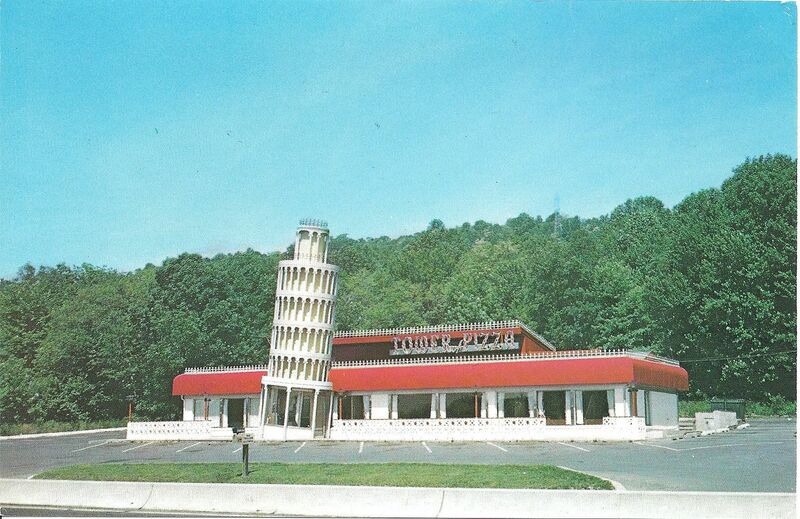 an actual Leaning Tower of Pizza. I think it became the Shogun 22 Hibachi place, which has actually survived for quite a few years now. I quite enjoyed the article. Oct-Dec 2017 saw me on a 5000-mile auto journey from Mississippi to Friday Harbor, Washington. Two months of camping along the way made manifest to me that the country is not about to explode in revolution. Great human solidity and resilience is to be found throughout the land. And yes, much of the America I knew 60 years ago remains. About a year ago, I started getting into Roadside America after reading about blackout parties in my native Connecticut. New Yorkers would come up here in the early 1960s to watch blacked out New York Giant football games at motels with antennas strong enough to pick up a signal from Hartford. My link is to a blog that is nostalgic for some of those old suburban stores. It isn’t my blog, but I stumbled across it last year when I was on this jag. Jon, I love that blog. As I wrote in the piece, it all looks very different, and yet very much the same. I suppose people will feel the same way about contemporary big box stores one day, though that’s hard to imagine now. You forgot another ethnic business – the Asian Foods in North Plainfield! Mark, I shop there a lot when I visit NJ! I believe it’s a chain and more of a big-box though. The Polish deli I mentioned (off 22 in Union), for example, has room for about 8 people! Addison, I’m glad that you loved it. Inspired by this, I wound up created an Instagram page titled This Used To Be The Future to capture road signs. Some were more modern, but there were a few older ones I was able to find on my commute up the I-95 Corridor from Groton, CT to Riverside RI. I’m not sure if it is still up. After that project, I moved on to some other pursuits. I grew up along US Route 22, but further west in Whitehouse Station. It was our main retail corridor as well, even though the surrounding area was mostly rural. I was recently reminiscing on FB that our local strip mall (now called Station Center) had everything you needed: Foodtown, Dominick’s pizza, Davids clothing, Mini-chek 5&10, dry cleaner, bakery and pharmacy. If you needed a department store, Falk’s was down the road (later Laneco and now a Walmart). You are really taking me back. Great Eastern Mills, Two Guys from Harrison and Korvettes (founded by 5 Korean War Vets) … to give them their full names. Route 22 the original combination shopping mall and highway. With stores on an island in the middle and on both sides going in either direction, and entrances from the parking lots directly onto the highway. If you could drive Route 22 regularly and live … you were a skilled driver. Actually many people got their first driving experience in the vastness of Great Eastern Mills espy parking lot in the evening. Mark – That’s actually close to where I grew up. I remember Laneco, and we used to eat at Mangia Pizza next door all the time. The Station Center had an A&P back then, converted to King’s in the early 00s or late 90s. 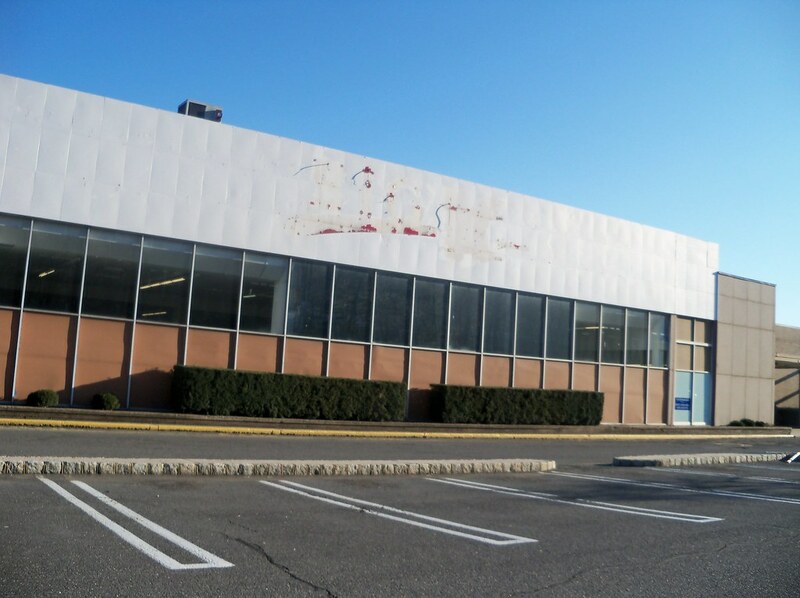 I remember when the giant Branchburg Shop Rite went up too. Steve – Yes, that parking lot is way too big, especially given that the outparcels weren’t built in the beginning. (As far as the outparcels, I remember the current Texas Roadhouse used to be a sushi buffet literally called Sushi Buffet). I’ve heard many complaints about the safety. The worst stretch for me is in the Watchung part, along a strip mall that now has a Unique Thrift at the corner. (Can’t recall what used to be there). The part with the wide median and stores on each direction and in the middle is quite a sight..
Really? That’s certainly not my ideal. I live in a suburb — coincidentally, one right off Route 22! We have a nice downtown, park, and library within a short walk of our home, charming streets, a train to NYC, and easy drives to everywhere else. Why is this bad? The author wishes to cram every family into an expensive city apartment? Force us to live on a mass scale? Many, many people have never wanted to live that way. That’s why, as soon as it became practical (initially with rail lines), suburbs appeared. I’ll take my suburban life, thank you, and certainly hope that your “ideal” never comes to pass. I would probably prefer an actual town over either a large city or suburban sprawl. There wasn’t a place to talk about it in this piece, but there are specific zoning codes that distinguish towns from suburbia. One of them, for example, is minimum parking requirements, which is why so much of the space on highway strips is parking lots. Another is the separation of uses – it’s generally illegal to have a corner store inside a cul-de-sac neighborhood, for example, or to have homes above storefronts. James Kunstler wrote about this in “The Geography of Nowhere” – in many places it is against code to build actual towns, even though they combine the benefits of cities with a lot of the pleasant aspects of suburbia. The cul-de-sac sprawl that I see around me in the South has never seemed at all right to me. I’m a native of the West, and grew up with towns that had street grids. Open up Google Maps and take a look at Great Falls, Montana, for example. Then compare that with, say, Conyers in exurban Atlanta. It’s a radically different human landscape…and, I think, a radically atomizing and deranging one. I struggle to find the right words to fully explain what I mean by that; what I keep going back to is not just the overall sprawl but the distance and disjunction that is enforced between even small sub-units. Another thing to mention: rural sprawl is a major thing around these parts as well. One might very well think that everyone is trying to move as far away from everyone else as possible. To this Westerner, the sensation of driving around even a low-population county in Georgia is that one never seems to ever get entirely out of town, and the towns and their boundaries aren’t always obviously evident. In towns of around 5,000 – 15,000 population, a typical pattern is that not just the new Wal-Mart shopping center, but even the new middle school and high school, and new churches, et cetera, are built well outside of the already-spread-out developed area. Soon, the residents find that a daily circuit of home-school-work-lessons-shopping-church activity-home involves 15-20 minute drives in each and every stage. In what is still a surprisingly small town! (population-wise, if no longer quite so small geographically). It’s actually that kind of sprawl (more than Atlanta’s) that made me more sympathetic to our old friend Kunstler when he gets super-ranty. Thank you for noticing that behind the highway strips, a lot of NJ is still rural/agricultural. I don’t know how many people I’ve spoken to over the years who honestly think that the mile-wide strip along the Turnpike is representative of the entire state. The distinction you draw between “towns” and “suburbia” is interesting. I’ve never heard it expressed that way before, but I think it does a good job of explaining some of the differences. I grew up in one of those NJ “towns” in the 50’s/60’s, but it was always referred to as part of the “suburbs”. And yet I knew quite well that the cul-de-sac style “suburbia” I kept reading about had no resemblance whatsoever to what I lived in, which had a real walkable downtown with apartments over the storefronts; and streets that actually went somewhere other than all emptying out onto the same arterial drive. I think this is the concept that has been lost in the “city vs. suburbia” arguments – that there IS a middle ground. Thanks for that comment. I always get annoyed when I people trash on the burbs, because that’s where I grew up and loved it. At least, we always called in the “burbs”, when it reality, it was a town, with grids, streets, etc. You could walk into town, bike around with your friends, do errands. And then I moved to California and learned what real “suburbs” look like and why everyone hates them. Now, we had cul-de-sacs and subdivisions at home too, but we still had the character of a town. It’s too bad. I’m not a fan of big cities, but need to live near one. And all that seems to exist near big cities anymore is miles and miles of sprawl. I would love to one day move back to a town that is walkable, once I no longer need to work in a city. Like Bill I think suburbs are an improvement over cities. I don’t want a walk-up flat above a noisy smoky bar. I like that we have a car for every adult, and a place to park these. I know about busses and trains. Thank God I can afford to avoid these. I don’t want a deli or sports bar next to my house. Please enjoy the city life with the smells and the criminals and noise. I think there are good reasons why people abandoned urban life. Well, there are people like me who don’t see the need for an oversized house or useless lawn. They don’t want to suffer from the hassle of owning a car and its effects on health and the environment. They also refuse to be isolated from other people. Josep: Somewhat shocked to find you on The American Conservative. Patricus is AMERICA aand CONSERVATIVE writ large.